Come join us during this 8 day Dolomites Autumn Tour. This tour will visit the Drei Zinnen, Lago di Braies, Alpi di Siusi, Langkofel, Lago Imides, the St. Johann Church, Passo Rolle, Cenque Torri and many more – including some hidden gems! We will stay in wonderful hotels where we can relax between the hectic shooting schedules. We will pick you up at the airport of Munich no later than 12am. After hugging each other it is time to start the drive to the Dolomites.After a 4 hour drive through 3 countries we will arrive at our first hotel, in the charming village of Cortina. This will be our home for the first 2 nights. After checking in to our apartment we will drive all the way to the Drei Zinnen parking place. From here we will hike for about 30 minutes to our first sunset location. This location offers an incredible view over the Drei Zinnen. We then do a quick dinner at a local pizzeria before heading up the mountain to shoot the milky way if the skies are clear. In the next morning, we get up early and drive to the amazing Lago di Braies. This calm and easy to reach lake is a must for everyone visiting the Dolomites. After a session here we go back to our hotel for breakfast. During the day we will go for a drive in area and see what it has to offer. For sunset we will either shoot at Lago Limedes or Cinque Terre. The conditions will decide. Passo Giau is our sunrise spot. An amazing mountain pass with incredible views. 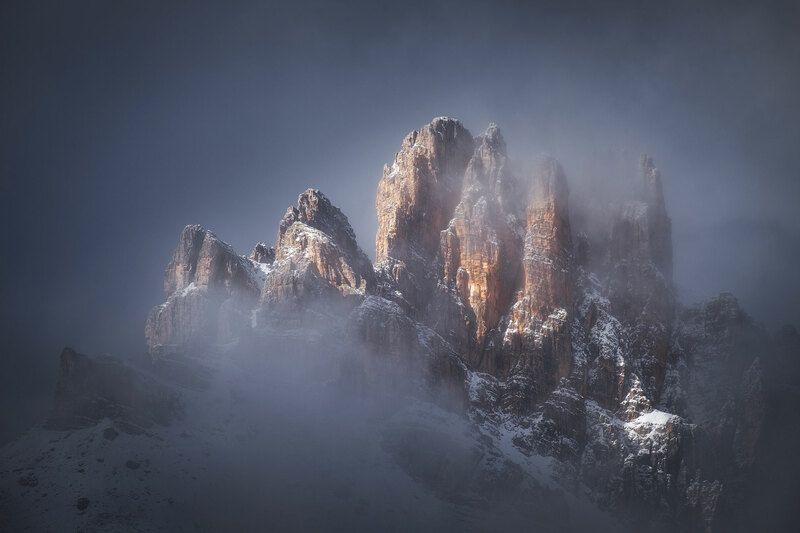 Now its time to move to the area around Passo Rolle.In this area we have views on relatively unknown yet one of the most impressive walls in Europe. This is also on of the few places where we can combine a river with the mountains. We will stay in this valley for sunset and hopefully the milky way. Sunrise will take place at a small lake with amazing reflections. Our hotel in Ortisei is a luxurious spa hotel, with swimming pool and everything we need to stay comfortable. Sunset will take place at Alpe di Siusi, easily one of the most stunning mountain locations in the world. During sunrise we return to the plateau of Alpi di Siusi, which is the largest high altitiude Alpine meadow in Europe! 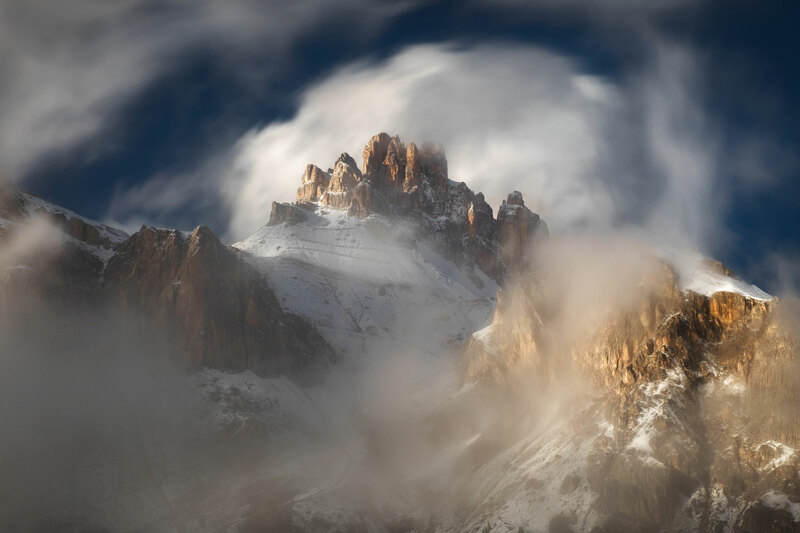 Not only that, it can be considered as one of the best sunrise locations of the alps, when the first light shines on the 3181 meter high Langkofel range. The morning often provides a thin layer of fog on the meadows, which is of course incredible for photography. After sunrise we continue towards the village of Santa Magdalena, where the famous St. Johann church is waiting for us with the impressive Odle mountains rising 3000 meters behind it.On this locations we will show the group different compositions, some are well known and other are more secret. One professional photo guide, all tuition, transportation and accommodation in hotels. International flight, travel insurance, visa. All meals and any personal items including alcoholic beverages, snacks and souvenirs.